Karloff (Frankenstein's Monster, Imhotep, pretty much every mad scientist ever, the Grinch) plays Dr. Bernard Adrian, a goodhearted man of science who's simply working to eradicate polio from his laboratory in a small town. The beginning of the film actually sets itself up with a fairly strong premise as we learn that Dr. Adrian lost both his wife and daughter to the disease and since has latched on to young Frances Clifford (Maris Wrixon), who has also been crippled by polio. He's dedicated to curing her and helping her to walk again, but some of his experiments have drawn the attention of the small town residents who are frightened of "science" and want the good doctor run out of town. They also allow their kids to pelt his house with rocks without any punishment. Why? Because they're content with raising rapscallions, that's why. Still, when a circus ape escapes and brutally mauls a man (who, in the ape's defense, had it coming), guess who they bring the poor fellow to? Yup, Dr. Adrian. Believing that the man's wounds are most likely fatal, Dr. Adrian puts the poor guy out of his misery and realizes that he now has a fresh supply of spinal fluid in order to concoct an anti-polio serum. While the initial serum shows promise when injected into Frances, the vial containing it accidentally gets broken. Shortly afterwards, the escaped ape attacks Dr. Adrian in his lab--because that's just what apes do. (Maybe he was wearing banana scented cologne?) Using the scientific method, the doctor deduces that the best course of action would be to turn the dead ape into a costume and go around killing people so that he can get a never ending supply of spinal fluid. Yeah, the movie is an insane mess. It really can't decide whether it wants to be a legitimate drama about the devoted passion a scientist has to cure a ravaging disease or a mad scientist film with a killer ape. I can forgive a bad movie, but not a boring one, and this film just doesn't have the legs needed to stand for it's brief 62 minute running time. We needed more insanity and this movie kind of dawdles. Maybe we can cut Karloff some slack, as he made 7 other movies that same year. My gosh, that man was a movie making machine! We have some writers on our staff who don't even review that many movies in a year! 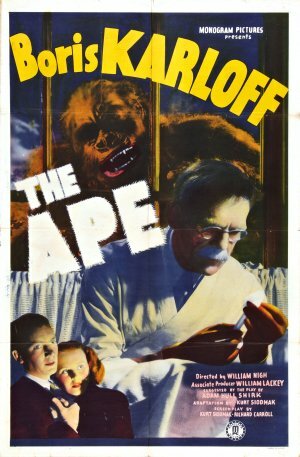 Still, The Ape just isn't that good of a movie and other than the fact that Karloff is attached to it, it would most likely have been forgotten to time. If you're planning to watch all of Karloff's films, you'll have to get to The Ape at some point, but just be warned that it isn't at all representative of what the man was capable of.